Sarmienta is a monotypic genus containing only the species Sarmienta repens. It is a suffrutescent creeper or climber, usually epiphytic. Stems are slender, flexible and sparingly branched, rooting at the basal nodes. Leaves are small, opposite, ovate to almost round and rather fleshy. 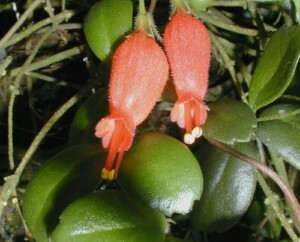 The attractive, axillary scarlet flowers are solitary and hang down. Fruit is a fleshy berry. Sarmineta scandens is distributed in S. Chile and Chiloe Island, where it grows in cool rain forest habitat on damp or mossy rocks and tree trunks. The red flowers suggest pollination by birds.